We follow the UNCG holiday closing schedule. 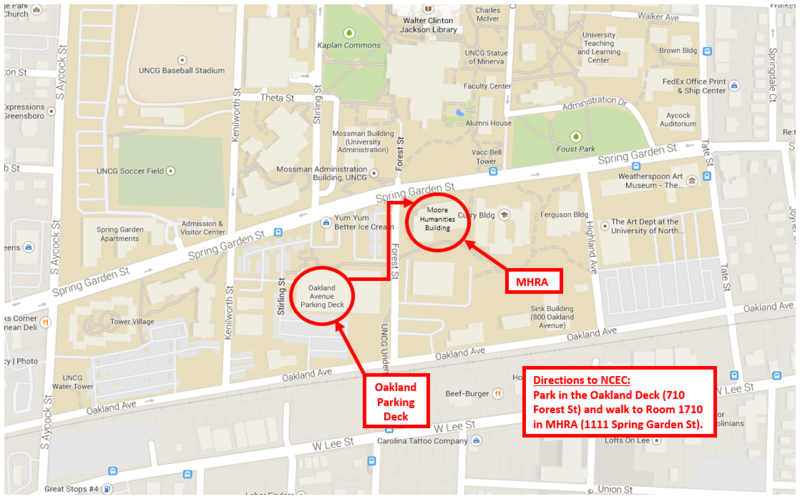 Parking is available in the Oakland or the Walker Parking Decks. Please see campus map below for locations. The MHRA Building is located at the corner of Spring Garden Street and Forest Street, near Yum-Yums and Old Town. Google Street View of MHRA Building linked HERE. Pay to park at the deck(s) decks are $2 first hour and $1 for each consecutive hour. $7 day/entry maximum. The Walker Avenue Parking Deck has an attendant available 24/7 (except holidays and breaks). The Oakland Deck has an attendant during weekday morning crunch times. All decks have pay-on-foot stations.